Zelda D'Aprano has spent much of her working life fighting for women's rights and equal pay. As an active unionist and member of the Communist Party, she often found herself at odds with her male comrades in the struggle to better women's working conditions. 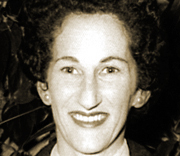 D'Aprano was born in Melbourne of poor Jewish migrant parents in 1928. Her childhood memories are of grinding working-class poverty and her mother's passionate sense of justice. A series of factory jobs after leaving school introduced her to the harsh inequities of women's working lives. Married at 16, with a baby by the age of 17, her early adult years were lived on a housing commission estate, struggling to make ends meet. Her first political step was to form a women's discussion group, which led to an invitation to join the Communist Party. By the mid-1950s D'Aprano had had enough of factory work. She obtained a job as a dental nurse in a psychiatric hospital, beginning 15 years of union activism on behalf of hospital workers. In 1969 she went to work for the communist-dominated Meatworkers' Union, where she was surprised to encounter poor working conditions and discrimination against female workers. In that year the meat industry was being used as a test case for equal pay, and during Arbitration Court hearings D'Aprano's frustration came to a head as she watched men arguing with other men about what women were worth. When the case failed to produce more than a token improvement, she took direct action in spectacular style-chaining herself to the doors of the Arbitration Court building. Soon afterwards she co-founded the militant Women's Action Committee, whose members refused to pay full fare on Melbourne's trams until such time as women were granted equal pay. For her outspokenness, D'Aprano was dismissed from the union, the memory of which still causes her deep pain. She became intensely involved in the early years of the women's liberation movement and in 1977 wrote an autobiography, Zelda: The Becoming of a Woman.